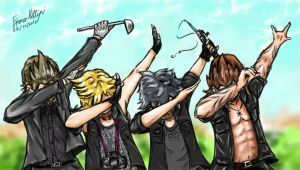 This is what I do when I play FFXV. For more Four Guys in a Car, check out the Four Guys in a Car Gallery as well as click on more comics below. All hail the Nixperience Band. They can sleep when they're dead. SLEEP IS FOR THE WEAK!!!!! My poor friend Aidan is Prompto. Those poor boys. I imagine Prompto's photos aren't going to look great, and I don't even want to know what Ignus's cooking is like. Wasn't there an ring which stops the leveling up when you go sleep? YOU'RE DARN RIGHT THAT'S HOW IT IS. Shouldn't they be dead now? No! We have to fight this Zu a few dozen more times! Then we can sleep! SLEEP IS FOR THE WEAK!!!!!! Thank god for the Nixperience Band. so rest up my friends! OK so the leveling up is a lil different in this game, you fight monsters like normal and you get experience points, however the experience points wont level up your characters unless you choose to make the characters sleep. You can either make them sleep at a tent or motels, which is free and cheap. Or you can save up a lot of money to make them sleep at a fancy hotel which has a x3 multiplier to the experience points, but it does cost a lot of money so you dont wanna waste that money if you only got like 200exp saved up, you wanna keep going until you got at least 100000 exp points saved up, then go to the hotel and turn that number into a whopping 300000 exp! gaining your characters like 30 levels in one night! Nixexperience band is your friend! My brother found it, and spent 40 hours grinding before leveling up. He went up 35 levels. It's basically the only way to play the game? ?